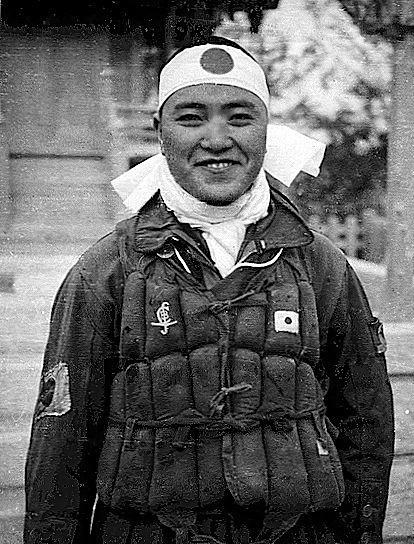 The Kamikaze (神風, [kamikaꜜze] ( listen); "divine" or "spirit wind"), offeecially Tokubetsu Kōgekitai (特別攻撃隊, "Special Attack Unit"), abbreviatit as Tokkō Tai (特攻隊), an uised as a verb as Tokkō (特攻, "special attack"), war suicide attacks bi militar aviators frae the Empire o Japan against Allied naval vessels in the closin stages o the Paceefic campaign o Warld War II, designed tae destroy warships mair effectively than wis possible wi conventional attacks. During Warld War II, aboot 3,860 kamikaze pilots war killed, an aboot 19% o kamikaze attacks managed tae hit a ship. ↑ Zaloga, Steve. Kamikaze: Japanese Special Attack Weapons 1944-45. p. 12. This page wis last eeditit on 16 Apryle 2017, at 17:19.